When I saw this title I knew I wanted to read it. HAD to read it, really. So I accepted a review copy and awaited it's arrival. It came and Jonathan questioned why it was, exactly, that I wanted to read it. "Is there something I should know about?!" Jonathan suggested that I might want to read a follow-up title called, "Praying for Your Husband NOW" or something that would suggest I should pray that I never have need of another husband. I confess the thought crossed my mind. But still there's the daughter angle and I'm not fond of Stormie Omartin's writing style so here I am. 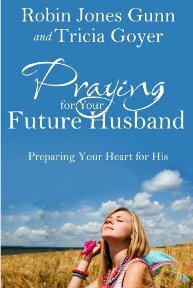 I read through Praying for Your Future Husband in a day. In other words, it's not a difficult read. However, it is divided into chapters and it would likely be hugely profitable to linger through it if you are a single in want of this particular message. I should also tell you that I've never read the Christy Miller series by Robin Jones Gunn in which the main character apparently writes letters to her future husband. I did the same thing when I was teenager but I have no idea who or what inspired me with the idea. I just did it, I think in part because it kept me focused and it gave me hope that somewhere out in this great, big, wide, huge world that God had someone in mind for me. I knew my husband wasn't in Texas (where I grew up.) I was firmly convinced of that fact very early on! I found that writing letters to "him" also kept my priorities inline and I was pretty dog-headed and stubborn about who and what I was going to wait for. Writing letters only intensified my emotions about it. (*Carrie pauses* I think I was already intense enough as it was!) At any rate, writing letters was a helpful exercise for me. Yes, let's just say that! I think Gunn and Goyer are a perfect match to write this book. The reason is not that they are both happily married with happily married children of their own - although they are - but is due mostly to the fact that they have completely different backgrounds. Robin Jones Gunn saved herself for marriage. She had a relatively pain-free romantic existence (barring a broken engagement) and that helped me to identify well with her. (I had a very pain free emotional existence as well, minus a wrinkle or two here and there.) Tricia Goyer, on the other hand, had a very tumultuous series of broken relationships. Her romantic entanglements began at the age of 13, resulting in a teen pregnancy at age 15, and an eventual marriage to a great and Godly young man to whom she has been married to for twenty years now. Both women have beautiful stories. They are just completely different from one another but it gives all kinds of readers a person to connect to on some level or another. The common denominator for Christian single women in general though is that we all desire to marry a godly, Christian man who - with any hope at all - has been just as diligent in looking for us as we've been in looking for him. Right? We hope, we pray, we dream, we wish, we think, we write up massive lists of qualifications and people we might perhaps share those lists with think we are being ridiculous - with some degree of reasonableness in thinking so. I had a list. I can't remember what was on it although I do remember spouting off some particulars to an authority figure in my life who cautioned me not to have such high expectations. I ignored them (although I confess to feeling a bit bewildered by their lack of support of my amazing list!) and continued to hope towards the perfect guy that God would have for me. Whether or not I actively prayed for my future husband I can't really say. I'm sure I did from time to time. Mostly I remember trying to keep my emotions inline and in check. I had a pretty strict list of acceptable behaviors for myself, which is why several of my friends were baffled and confused when I made friends with Jonathan. I allowed myself a friendship I had never previously allowed. And I prayed a lot as a result of that. All the time! Every night I prayed, asking God whether or not I had permission to continue the friendship for another day, or if I needed to walk away from it. (I have vivid recollections of pacing the floor at this point.) Every night I was given crystal clear permission for another day. That's about as, er, enthusiastic as I believe I ever got about praying for my future spouse. However, I can tell you that writing letters and purposing things for myself (i.e., my first dance would be his, my first kiss would be his, etc.) helped me out in the long run. Furthermore, in the end, God blessed me with absolutely everything on my list! It's absolutely true! (I'm not saying God always gives you your list, I'm just saying that my ideals were met in exact detail with a few other things thrown in for good measure.) That to say I am a hearty and enthusiastic fan of presenting one's self to God and asking for direction for a spouse from the Giver of All Good Things. God isn't out to make your life miserable by arranging a marriage with an ugly, lazy fellow. (If you are a single female or have ever been one, you know which fears I poke fun of.) He is wonderful about granting the desires of your heart if you follow after Him. "She will do him good and not evil all the days of her life." It is because of Proverbs 31:12 that I think Praying for Your Future Husband is such a must-read for teenage girls. I think anyone who is married can see that this is a mighty fine list to be praying about! Bonus points for this book in my opinion: not only does each chapter conclude with a suggested prayer for the future (unknown most of the time!) spouse but it also includes a prayer for the single woman as well. Gunn and Goyer both stress the fact that whatever you are praying for your spouse, you should be praying for yourself as well. Whatever you think you want in a future spouse - be it trust, intimacy, protection, etc. - you can pretty much safely assume he'd be delighted to discover in his future spouse. So work on yourself first and foremost, and pray for him diligently as well. They also place a particular emphasis on the fact that young men today need prayer protection. Gunn and Goyer do not in any way advocate building emotional attachments with guys that you know and think might be "the one." Rather they encourage you to pray that God will protect the unknown man that He has planned for you and pray that He will reveal who that person is to you in His perfect time. They also point out that God's timing and ways are different than our own and we shouldn't jump around assuming or hoping too hard about who our spouse may (or may not?) be. Trust and obey is the general theme of this book. The other message is that you can develop the spirit of a prayer warrior for your spouse before you ever know who he is. Then comes the bit about Proverbs 31:12 again - you can do him good all the days of your life. Prayer works very effectively, to protect and to bind hearts together before they ever come together, officially speaking. I am totally all about this book. (What a clever sentence there, huh?) I would heartily recommend it to any single young lady who does recognize (and admit?!) that she wants to be married some day. As Gunn and Goyer pointed out (and I can personally testify to) when you purpose to obey God in the area of romance and do set your ideals and goals before God to shape and to mold, He will help keep you on a safe track and will bring a husband that is just right for you (and who delights you!) in His perfect time. I could talk on and on and on about this subject but as I am sure a good many of you can as well, I'll stop and we can dialogue in the comment section. I'd love to do that with this read in particular! Thank you, Waterbrook Multnomah, for not only publishing this book but for sending me a copy. Loved it! I've been seeing this book around a lot, and have heard nothing but great reviews. I'm thinking about getting a copy just in case I have a little girl one day. Sounds like a great resource! I've read all of Robin's adult Sisterchicks but only one meant for teens -- not Christy Miller but one about one of her friends. I would say, though, that praying for future wives for sons is just as important as praying for future husbands for daughters. :-) Sadly, I don't think guys read this kind of book as much or think about future spouses as much as girls do. Just read another positive review of this book. If I had a daughter...! My oldest son had a list (in his senior Bible class, they covered Marriage and Family and encouraged them to make one) and the night he proposed, he gave his fiancee his list. So sweet! I'll have to remember this book for when my girlie gets a little older. I remember having a vague mental list and being rather careful. My hubby was my first kiss, my first everything, which is a set of decisions I've never regretted! I don't remember praying for him faithfully but I'm sure I did on random occasions. Sounds wonderful. I'm thinking I"ll have to pick it up for my 15 yod. :) Thanks for the heads up! I didn't read the Christy books, but RJG was the author who turned me on to Christian fiction. Her first book in the Glennbrooke series was very good...and not too romantic. :) I have a Goyer book in my review pile. My stepmother read it while she visited one weekend and really enjoyed it. From their backgrounds, it sounds like they were the perfect pair for this. Anyway, this sounds like a great resource for any unmarried woman or girl...at an early age. Makes me wonder how I ended up with a husband like Derek...oh, by God's grace. It wasn't until I was in my 20's that I became serious about my walk with God though I became a Christian (undiscipiled) in my teens. I really need to pray for Derek so much more than I do. A good reminder. Thanks. If I had daughters, I certainly wouldn't encourage this to be a focus of their prayer life. I think early preoccupation with marriage (or similarly, early preoccupation with career or not dying of cancer) is unhealthy. Many women will never marry, especially those who hold out for Christian spouses. I will encourage my sons to be men of God, whether they marry or not. I don't know that I'd call it a pre-occupation with marriage. It is an honest, (healthy) and natural desire though. And I'd certainly encourage my children to be godly individuals who submit to the will of God. But if they do have a desire to marry, which I suspect that they will because most people do, then I would encourage them to pray for themselves and their future spouses. We can't, any of us, know the future. But I do think it is perfectly good to admit the desires so that they can be properly addressed with prayer and instruction. Oooh, I'd love to get my hands on this book! Sounds like it would be invaluable to a single girl like me. I'll have to keep a lookout for it! Thanks for the review! As a single young woman, I really enjoyed this book. I've prayed for my (unknown) future husband many times in the past few years, but this book gave me a lot more ideas, and more encouragement to continue to pray. It's a great book! This sounds good, Carrie. I don't remember really agonizing in prayer over my future husband, but I was rather reticent when it came to dating. I never dated recreationally, and Steady Eddie was my first real boyfriend. I'll keep this book in mind for the future with my girls. Yup, I'm predictable. Though my intent was the amount of focus rather than the idea itself, which I think is a good one. This sounds like a pretty solid book. Make no mistake about it, Cheryl is a godly woman and I appreciate her example--but as someone who'd been praying for my future husband since I was ten or eleven, her story didn't offer me much consolation. Once I got into my twenties and was a sponsor at youth group myself and people started trotting out Cheryl's story, I tended to get rather upset. I felt like the message being sent was "Keep praying and God will give you that husband"--and that somehow the successful attainment of a husband was the reward of faithful prayer. Since by then I'd been praying for over a decade, I felt like I deserved the reward already. I still pray for my future husband (should God have a future husband for me), but I have found that there are times when, as a means of submitting my heart to God's will (whatever that may be), I need to turn my focus away from praying for (or to have) a future husband. In those times, I often find that I need my prayer to be that God would make ME into the woman He would have me be--not simply "in order that I might be a good wife and mother some day", but in order that He would be glorified in my life, regardless of what state He chooses for me. This sounds like something I need to read, doesn't it? I don't pray for my future husband as much as I should (well, I don't pray PERIOD as much as I should). I do often make decisions on what to pursue based on how it would affect a future marriage or family whether practical issues (i.e. learning how to make cheaper, fresher food) or spiritual ones.